1. Heat the oil in a wok or large frying pan. Cook the Onion & Garlic over a medium heat for 5 minutes or until soft. Add the Paprika, Tomatoes & Stock. Bring to the boil. 2. Turn down the heat to a simmer, stir in the Pasta and cook for 7 minutes, stirring occasionally to stop the Pasta from sticking. 3. 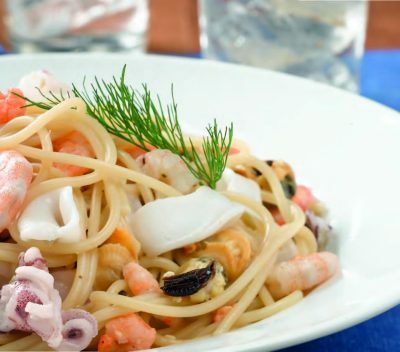 Stir in the Seafood and cook for 3 minutes, until it’s heated through and the Pasta is cooked. Season to taste, sprinkle with Parsley and serve.